A new study has found that young boys who spent a lot of time playing videogames suffer from lower reading and writing scores than their non-gamer peers, yet ultimately suggests that games "aren't inherently harmful." 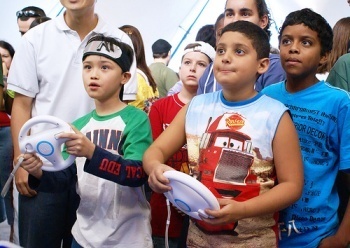 Conducted by Robert Weis and Brittany Cerankosky of Denison University, the study was simplicity itself: Hand out PlayStation 2 consoles to a bunch of boys, then stand back and see what happens. More specifically, 64 boys, between six and nine years old, were recruited for the study, half of whom were given PS2 systems and three "all-ages" games, while the rest remained console free. Parents were told that the study was designed to examine their development and that the games were just an incentive for taking part. Four months later, when the researchers returned to examine the results, they discovered that the boys who had been given the consoles showed "significantly lower reading and writing scores" than those who had not. While the non-gamers had grown more skilled at reading, writing and spelling, the boys with consoles either remained flat or actually became slightly worse. Yet the games had no apparent impact on mathematical skills, attention spans, ability to concentrate and adapt or on their behavior at home. The problem, it turns out, isn't the games, it's the amount of time kids spent playing them rather than doing other things. Diaries kept by parents revealed that the boys who had been given consoles spent an average of 40 minutes a day on them and 18 minutes of after-school studying; in comparison, the control group spent an average of only nine minutes a day gaming (on friends' systems) and 32 minutes a day on studies. The link between games and reading skills disappeared once that work/play imbalance was accounted for; math skills remained unaffected because, while reading for entertainment isn't all that unusual, nobody's going to break out the textbook and do long division problems for fun. "Our findings suggest that video-game ownership may impair academic achievement for some boys in a manner that has real-world significance," the researchers concluded. But it's not the games themselves that are the problem, according to said U.K.-based science writer Ed Yong. "These results suggest that despite some people's inclination to fear new technology, video games aren't inherently harmful in themselves," he wrote on his blog. "Their danger lies in their ability to shift the balance between work and play." So, to recap: Too much videogaming, like too much television or too much junk food, isn't good for kids and parents need to keep a lid on it. That may sound like simple common sense, but it's the kind of obvious conclusion that seems to escape a lot of people.